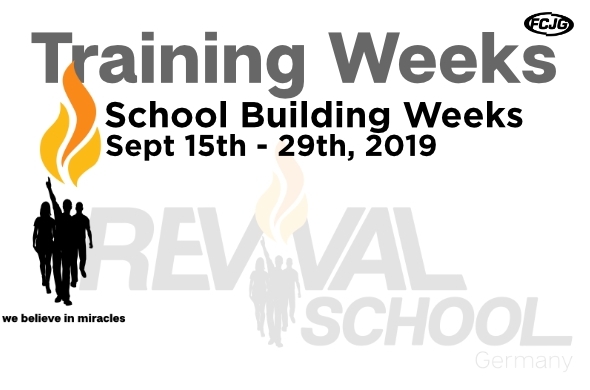 Participants of Training Weeks are immersing into the life of the REVIVAL SCHOOL: worship and prayer, teachings held by FCJG staff and international guest speakers, outreaches (depending on the topic of the week), fellowship and working times, getting to know FCJG and its community life. By purpose, training weeks are not organized in a seminary style. They help you to immediately put into practice what you have learned. It’s not about hearing only, but to get into practice immediately. It’s not about piling up knowledge, but about getting changed and equipped by the Holy Spirit. Our hearts and not our heads are to be filled. These weeks will make you a revival bearer who can – filled with the Holy Spirit – change his own environment by the power of God. Furthermore, you can get to know the REVIVAL SCHOOL better and find out whether God has something in store for you here even for a longer period of time. You will life in a 2- or 3-bed dorm and will also take an active part in the practical work that has to be done. More details about our daily life are found here. Further, you will be integrated into our community, joining our evangelistical teams as well as our devotions and services. More generell infos are found here. Power Evangelism – this is not just a name we made up. The gospel itself IS the power of God, coming alive through signs and wonders! We do live in the best time ever, because the largest harvest the world has ever seen is ripe to be taken in. And you should be a part of this mighty movement initiated by God. You are destined to bear much fruit and to have an impact on your generation. You are destined to crown your heavenly father with souls, which are born into the kingdom of God through your life. These two or three weeks of “Power Evangelism” will help you to grow in these dimensions. You will be trained to walk in the gifts of the Spirit, to heal people boldly through His power and to lead them to Jesus. Men and women of God, who are living and walking in those dimensions, will equip you with teachings and we will have many outreaches in our city and in our region to put the word into action. You will also dive into the community life at our local Revival School. Take the challenge to discover the treasures that God has placed inside of you to spread His gospel in power. You can join for two or three weeks. 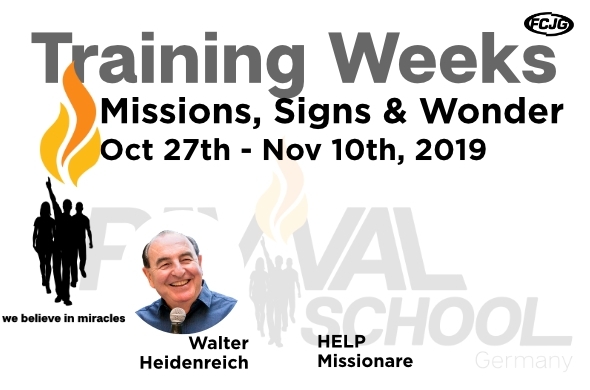 The third week will take place in our ministry HELP-FCJG Vienna in Vienna/Austria. We will live together, as we did in Lüdenscheid. 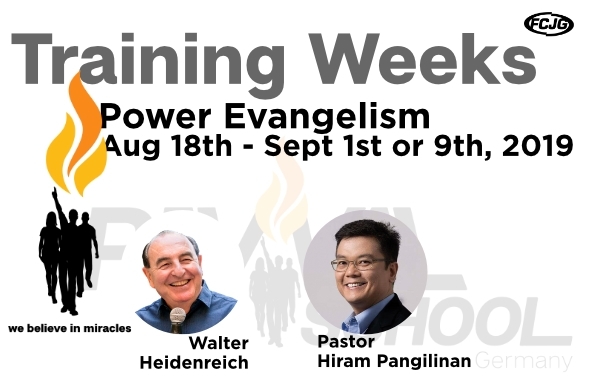 One week more to be trained and equipped to share to God News in power, already even in another nation! Two very praktical building weeks! Experience fellowship, worship and hands-on work. So that training and mission are able to take place. A special invitation also to families! The Great Commission is still red-hot! With the Holy Spirit all things are possible. Lern how to fulfil the Great Commission and see how signs and wonders will follow you!